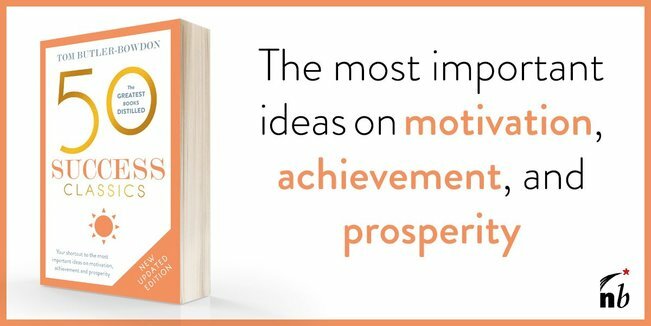 Often provided as a complimentary copy in Marriott hotels, this book may be an unlikely success classic, but in a surprisingly modest way it illustrates valuable principles which can be applied to personal as well as corporate achievement. If you travel with any frequency, you have probably lodged in a hotel managed or franchised by the Marriott company. If your stay was enjoyable, it was not by chance. Over several decades, Marriott developed 'standard operating procedures', such as 66-point checklists for room cleaning, recipe cards for the restaurants and guest satisfaction scorecards, to ensure uniform high standards. The author makes the startling remark - for an entrepreneur - that building a business 'can be boring'. There is lots of grunt work, but you have to put in the hours to create systems which work every time. Without consistency, a service business does not create an enduring positive reputation. As Orison Swett Marden remarked, "Success is the child of drudgery and perseverance. It cannot be coaxed or bribed; pay the price and it is yours." Is attention to detail and hard work the only factors which account for Marriott's rise to be industry leader? Let us briefly consider some important points in the company's life. In 1927, JW Marriott Snr. moved with his wife from Utah to Washington DC. Their first step into the hospitality industry was a small franchise selling root beer. Marriott Snr. later established a chain of restaurants called Hot Shoppes, which flourished through the Great Depression. In 1937, noticing that passengers on the newly emerging airlines wanted to eat, he formed a successful in-flight catering business. This was followed by contracts for cafeterias feeding government workers through the war years, and later for industrial canteens including General Motors' and Ford's. The first Marriott hotel was not opened until 1957, by which time JW 'Bill' Marriott Jnr had finished college and joined the company. Seeing the potential of the expanding hotel business, he took over the lodging section of the firm and began opening more hotels. By the 1960s, Bill Marriott voiced the hope that 'one day' the company could equal the success of the Howard Johnson chain, which then seem to line every American highway. While Howard Johnson lost its way, Marriott prospered. By the 1980s, it had become one of the biggest real estate developers in the country, in some years opening two new hotels a week. Yet they did not actually own the hotels. The family had realized that their greatest profit, and their greatest expertise, was in managing hotels, and as soon as they had been built they were sold to investors. Left with the valuable long-term management contracts, the company enjoyed the flexibility of not having heavy mortgages to service. This system worked because the company had identified the one thing it could do better than anyone else: designing and implementing the processes which resulted in a great guest experience. This narrowing down of purpose paid dividends. Today, Marriott has over 2000 establishments in 40 countries. Its four publicly listed companies are worth over $12 billion, and it employs more than 130,000 people. These are impressive figures, but how do we explain how the leap from a $50 million enterprise in 1960, to one worth over $12 billion today? In anyone's language, this is a case of 'good to great'. The first answer may seem obvious, but Bill Marriott maintains it is how they treat staff. He writes that Marriott is in the people business more than it is in the service business, and that 'if you treat your people right, they will treat guests right'. If they are stressed, dissatisfied or poorly trained, it is the customers who will feel the effects. This 'employee first' policy is almost a cliche, but the company actually puts its money where its mouth is with a profit-sharing program in place since 1959, better than average training systems and a free phone line to counsellors and experts to solve non-work problems. This, and a culture of openness which ensures that staff at all levels of the organization are listened to, has led Marriott to being judged one of Fortune magazine's 'Top 50 companies to work for'. In contrast, chains focused only on making money, which do not try to produce any service 'buzz', have had only average growth. It is only when a person feels that they are at the front line of a noble idea (in this case, making hotel guests feel welcomed and valued) that they will be motivated. Bill Marriott identifies two turning points, what he calls 'revolutions', in the company's history. The first was to move from its catering roots into hotels on a large scale. The next came in the 1980s. The company realized that its growth would be limited if it only ran 'full service' hotels, and looked into the idea of building other types of lodging, including medium priced, budget and long-stay. Since the fear was that these sideways moves would dilute the Marriott brand, there was fierce internal debate about what to do; many Marriott staffers thought it would be twenty-five years of work down the drain. Those in favor won, and the company began building the 'Courtyard by Marriott' hotels. Suddenly, the huge mid-priced and budget hotel market became their oyster, and the company grew exponentially. It was able to do this without harming the full-service Marriott brand because the cheaper hotels were run on the same strict quality control lines. Unlike other chains, amid the expansion it did not lose its commitment to the customer, or its relentless service improvement goals. Marriott quotes Alfred North Whitehead: "The art of progress is to preserve order amid change and to preserve change amid order." The company certainly found itself in some dead ends: investments in a travel agency, a cruise ship company, theme parks and home security systems. Yet Marriott says, "Companies that don't risk anything will inevitably find themselves falling behind those that do. You can lead change or it can lead you." Yet risk-taking only makes sense when you have a core set of values which do not change. "Truly great companies maintain a set of core values and a core purpose that remain fixed while their business strategies and practices continually adapt to a changing world." These words from management thinkers Collins and Porras sum up not only the Marriott company, but success generally. If you know who you are, you can be more flexible in what you decide to do, and clearer about what not to do. In their groundbreaking Built To Last: Successful Habits of Visionary Companies (1994) Collins & Porras overturned conventional thinking by suggesting that great, long-lasting companies are rarely founded upon some marvellous new product. Often starting very slowly, these firms put an emphasis on the vitality and philosophy of the firm itself; from this springs great services and products. In Marriott's case, we notice: its organizational culture of openness; an ethic of continuous self-improvement; an eye on the future; and attention to the little things. In putting good service before money-making, it paradoxically guaranteed its own profitability. This bundle of values created a sense of internal identity even amidst massive expansion into new areas. The Spirit To Serve is not a trumpet-blowing history of the company. Bill Marriott is candid about the mistakes the organization has made and the opportunities they perhaps should have taken. But above all, his surprisingly understated work is about keeping true to your original purpose. "If you're in the service business and your name is above the door, it's important for people to be able to link a face to the name. I want our associates to know that there really is a guy named Marriott who cares about them, even if he can only drop by every so often to personally tell them so." Born in 1932 in Washington DC, Marriott started working for the family firm when he was 14, stapling invoices in the accounting department. He worked for four years in a Hot Shoppe restaurant while obtaining a finance degree at the University of Utah. Graduating in 1954, he spent two years as a supply officer in the US Navy, followed by marriage to Donna Marriott. At 32 he was made president of the Marriott company, and in 1972, age 40, his father passed the CEO role onto him. The Marriott's three sons and a daughter all now work for Marriott International.